Most folks who skied in the 1950s and 1960s will tell you the “good old days” were not so good. And for some that also applies to the 1970s. To be honest, I am not sure where I stand on this. I know my equipment and clothing are so much better and I love the fast lifts, but at the same time, I sometimes feel like skiers and riders today are missing the heart and spirit of what we were so thrilled to experience on the slopes—adventure and a sense of discovery. Before modern grooming—to say nothing of snowmaking which didn’t exist most places in the late 1950s and 1960s—every trip up the mountain (hanging on to rope tows, pomalifts, T-Bars) was an adventure and the thrills and spills on the way down were part of the fun. Rocks, bare spots, bumps and deep snow were taken in stride or simply tripped over. 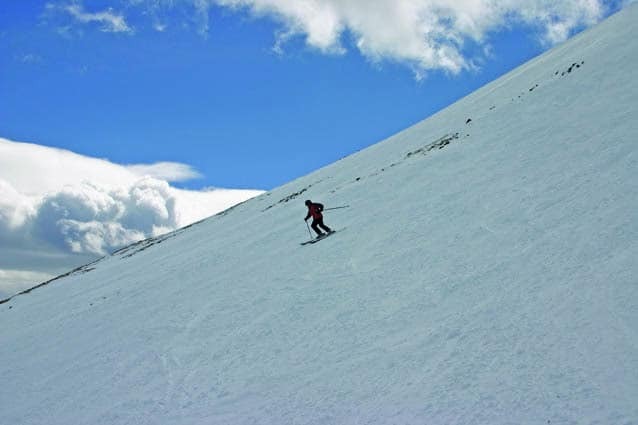 I was at Beaver Creek in Colorado in 2006 with my brother Robert and his friend Mike when on our first chair ride I spied a perfectly groomed steep trail. “Let’s do it,” I enthused. “You always warm up on blues and that’s a black diamond,” my brother warned. “Not when it’s so perfect,” I had retorted. Surprise — the perfect corduroy was rough as a corncob. It had been groomed late in the day and then set up overnight to a slick washboard surface. So much for modern technology (power tillers). Later, we skied another black diamond only to discover that it had been left au naturel — deep snow and huge bumps. Being used to groomed, I was out of my ‘modern-day’ element. Not a pretty sight! Yet, that was what we often skied in the “good old days” and what so many seek today. Go figure. On to the Birds of Prey trail. This upper mountain area is where they hold World Cup races at Beaver Creek. There are actually three trails there and while my guides sampled the downhill run (Golden Eagle), I negotiated a nearby green that was a mess of soft, gloppy piles of corn snow mixed with icy patches. But it led to a blue that was heavenly due to a different exposure. On our ride back up, Mike inveigled me to do Golden Eagle, noting it had good snow on it and as a writer I owed it to myself. “I won’t kid you, it’s very steep dropping in,” he had added. We had cat tracked over to the drop-in point so, deciding I didn’t want to climb back out, I took the plunge. Startled by a bad case of nerves, I traversed until the pitch lessened, relaxed and enjoyed the rest. They wisely didn’t watch me. At the base, Mike exclaimed, “Imagine Bode screaming down that at 70 m.p.h.! Want to do it again? The sick feeling at the thought and my relief at surviving made me nix the idea though I later admitted I was glad to have skied it, even if not Bode-style. Skiing over to Bachelor’s Gulch and Arrowhead, I was in heaven swinging down sweet blues and occasional blacks and overdosing on gorgeous scenery. That day was a whirlwind tour I shall never forget, but those three tough runs stand out in memory even more than the “perfect” trails we explored. Skiing is so much more than a trail or conditions — yesteryear or today. It’s the experience of a new adventure, whether mellow, mesmerizing, or menacing. It’s about discovery — not just of a great trail or what lies around the next bend but of emotions like fear, determination, relief, elation, joy and appreciation. It’s about comprehending the meaning of overcoming a challenge, experiencing gratitude for the beauty of the mountain, and understanding the joy of sometimes just surviving — or swinging down a green. It’s friends encouraging you because they want to share the alpine spirit. I hope you enjoy the process of discovery — be mindful and make some sweet mountain memories. After riding the Imperial Express Chair to the 12,840-foot elevation at Beaver Creek, which was the highest lift served point in U.S. in 2006, can cause skiers and riders to become light-headed before evening skiing or riding in the Imperial Bowl.